An all-new, almost-flying menace known as Phorusrhacidae rapidesultor has joined the strange realm of Ark: Survival Evolved. But don't worry about struggling with that tongue-twisting handle, because you can just call it the Terror Bird for short. The Terror Bird stands from eight to 12 feet tall, and while it can't actually fly, it is capable of “high-speed sprints and brief leaps.” It's aggressive but can be tamed, and its combination of fast ground-based travel and near-flight capabilities makes an excellent combat mount. It's also kind of goofy looking, which I like: Getting smoked by a T. rex is one thing, but taking a thumping at the hands (claws?) of an oversized dodo bird adds a layer of humiliation to the action that I consider a real selling point. The latest Ark update also includes the “game-changing” grappling hook tool that gives players the ability to climb sheer walls, snag objects, and drag (or be dragged by) creatures of various sorts, including those that fly. Tribal Alliances are now functional, enabling small Tribes to band together against larger ones in both PvP and PvE modes, and Coel fish now come in different sizes that provide differing amounts of resources. 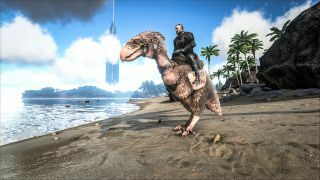 The Ark: Survival Evolved Terror Bird update—technically known as version 2235—is live now, while the game itself is on sale for $20/£15 as part of the ongoing Steam Lunar New Year Sale.